Recently someone ask me: "What do you think will be the best Long Island wine to pair with a grass fed local steak if money is absolutely no object (and what's great about the wine, or the producer, or why it's great with steak)? Here is what I answered. In my opinion, money isn’t always synonymous of quality and when it comes to Long Island wines, it is definitely true. Although, usually, Money rhythms with hand-harvested, low yield and therefore limited production, long oak ageing and targeted markets and customers; sometimes, the high demanded price of a wine also often reflects the cost of the winery’s investments, marketing and yearly structure and vineyard maintaining: new barrels, new stainless steel tanks, etc… and probably a touch of greed added to the overall equation. On Long Island, even if quality tremendously rose over the last 5 years, as well as the number of producers, only a handful of producers distinguish themselves from the bunch for their consistency. And Wolffer Estate is definitely one of them, more especially their Cabernet Franc, which is the benchmark of their portfolio and a standard for the region as far as grape variety characteristic, is concern. Wölffer Estate Vineyard is unquestionably a beautiful place. But the creation of it spanned over three decades and required a creative vision, an ability to bring dreams to reality and a great deal of dedicated hard work by many people. Christian Wölffer possessed the vision and with the meticulous care of his professional team that built this special place – Wölffer Estate Vineyard - that was created, first and foremost, to be enjoyed by people. The original parcel of land was a potato farm with an old farmhouse in what is now the middle of the estate. Over the years as more acres were acquired, paddocks and stables were added and in 1987, the vineyard was founded. This 55-acre winery is part of a 175 acre estate with boarding stables, 30 paddocks, an indoor jumping ring, and a Grand Prix field. Both the stables and winery have a European character and these former potato fields have become the foundation for world-class wines. Wölffer Estate Vineyard is an American Winery in the Classic European Tradition. As for the wine, the 2007 Wolffer Cabernet Franc will greatly suitable to pair with local grass fed steak. 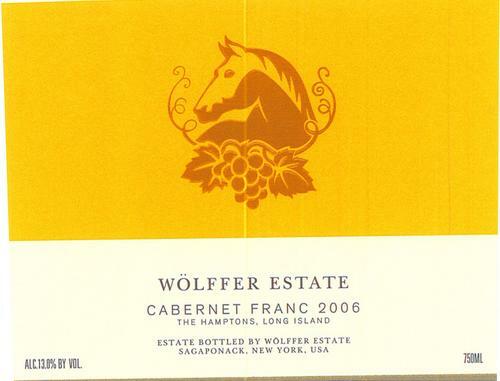 As for the wine, the 2007 Wolffer Cabernet Franc will be very suitable to pair with local grass fed steak, due to its present yet integrated tannic structure, balance and complexity of flavors, which combine European elegance and earthiness with the typicity of their Long Island Terroir. These factors will surely enhance the substantiality of the meat and complement its taste. Beside its medium, bright ruby color, the nose is redolent of dark and blue berries, white pepper, cedar and vanilla aromas. Slightly restraint at first, the palate, which needs decanting, is elegant, focus and expanding with ripe fruit flavors intermingled with peppery, slightly vegetal nuances, framed by soft tannins and balanced by bright acidity into a smooth, earthy finish. Despite steak, it will also pair well with hearty and meaty dishes like Duck confit, Cassoulet and slow cooked Beef short ribs (a great combination).